The Hublet has just rushed out of the door, running horribly late for work as we’ve both been transfixed by the big breaking story of the day: switching on CNN this morning while preparing breakfast, we learned the awful news that a young man has gone on a rampage at a Century 16 Cinema complex in Aurora, Colorado during a midnight night screening of newly released film The Dark Knight Rises. 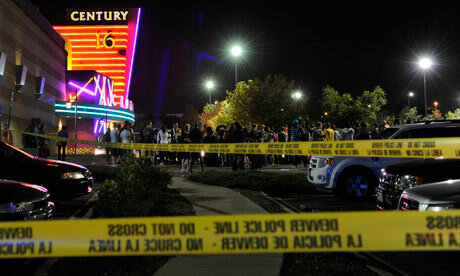 Fortunately the subject, 24-year-old Aurora resident James Holmes, was located and apprehended near a car behind the theatre, with Aurora police spokesman Frank Fania saying, “He did not resist, he did not put up a fight,” and a rifle, a handgun, a gas mask and possibly additional weapon(s) were found inside the vehicle. Sadly the damage has already been done, with the current death toll standing at a shocking 12 dead, with a further 38 injured, some in a gravely serious condition. FBI officers are also conducting a careful search of Holmes’ apartment, and exercising extreme caution after he advised explosives were present. Witnesses in screen room 9 say that at around 12:30am during the first action scene of the movie, a man entered through an emergency exit to the right of the room, dressed in black and wearing a black mask. At first movie watchers thought it was possibly a dramatic addition to the screening and maybe live special effects being put on by the cinema, however as the man began to throw gas canisters into the room people realised something was horribly wrong and panic ensued, with the shooting beginning shortly afterwards. Some have claimed that the shootings were random, others feel the shooter may have been targeting someone specific in the crowd. Warner Brothers, the studio behind the film, made the decision to cancel the Paris Premiere as well as all publicity interviews with Christopher Nolan and cast members, all of whom are said to be in a state of shock and grief over the shooting. Hopefully at least with the suspect in custody we’ll have more information on why this shocking tragedy occurred, but sadly for at least 12 families there is no news that can bring them comfort at this time. Next Post Is This The Most Fabulous Grandmother In The World? Previous Post Where Is Balloon Boy Now?